John Alvarez was a bad boy—so bad that a judge finally gave him a choice between prison and the Marines, yet in the Corps he discovered a home. Shipped off to Vietnam, he leads his own band of bad boys—Iron Raven, the terror of their enemies and always the first choice for a dangerous mission. On one such mission, the brain child of a couple of CIA ops, Alvarez and his squad are cut off from escape by their CIA handlers and are left to fight their own way out or die. Only Alvarez survives, and his revenge on the men who abandoned him and his friends, lands him in prison for life. After twenty years he’s offered freedom, but only if he agrees to undertake another suicide mission: to act as bodyguard for a Mr. Standish on a journey into a mysterious Amazon kingdom ruled by the devil himself. It is only in the heart of the jungle that Alvarez discovers he is on a mission that can only have two endings—redemption or death. 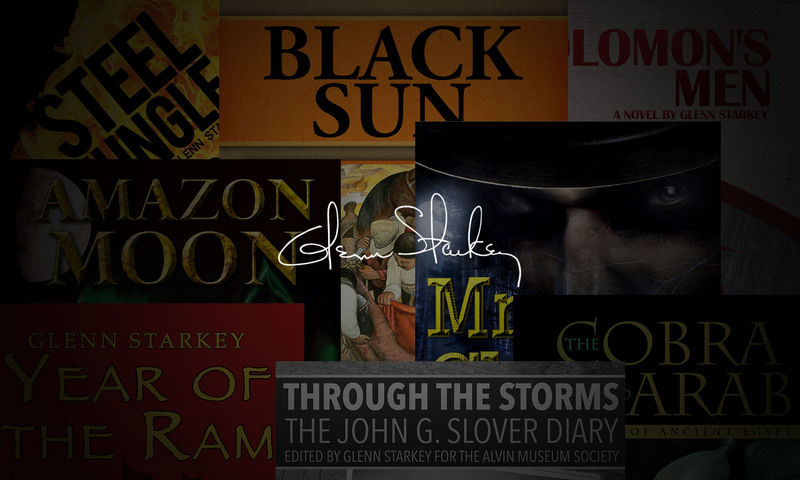 Upon completing Amazon Moon , Glenn wrote My Journey with Amazon Moon, an essay you can find on his website. In it he states the novel led him down many soul searching paths, and how his research actually made him take a different writing direction than originally intended. The essay is well worth reading from a humanitarian viewpoint. A hint of a grin broke the stoic expression his mixed Spanish and Indian ancestry usually held. Gaze sweeping the shoreline, he maintained his vigil as his grandson walked into the river. Slender and bronzed from a merciless sun, the boy stopped and bent to fill the jugs when the water reached his shins. At the reminder of the fierce brother to the alligator, Ignacio cast a wary glance in the direction of every splash he heard about him. He frowned and shook his head. The leathery-skinned man benevolently nodded agreement. Unfortunately, his grandson had become a man, forced to grow beyond his years in a land that allowed little time for children to enjoy their youth. Jungle predators, the harsh climate, disease, poverty, drug runners, armed bands of leftist guerillas, these and more cared nothing for the innocence of a child. They demanded the strong survive, and the weak perish cruelly. The willowy boy rose from the water, his thin arms straining against the weight of the jugs. Whipping his head to move thick locks of black hair from his face, Ignacio turned to face his beloved abuelo standing on the shore. His eyebrows drew downward as he tried to understand the change in his grandfather. Such was the manner of old men who kept dark secrets well-guarded, allowing fragments to escape against their will. Fear clutched the boy’s throat when Papito’s eyes flared. Adrenaline flooded the young man’s body. He released his hold on the jugs and tried to leap to the bank, but his feet held fast to the river bed. The heavy weight of the water-filled jugs had sunk him deeper than he realized into the mushy mud. He lost balance and fell forward into the shallow water. Jerking his legs frantically to free himself, he clawed and crawled his way toward shore, spraying a wall of mud-swirled water and river debris about him. The machete cut an arc through the air as it cleared its sheath. Arm waving over his head, Papito raced past his grandson toward the river, ready to make a stand against the black caiman drifting slowly in their direction. “You will not take this one!” Years of anguish, anger, and fear permeated his voice. Papito shook the razor-sharp weapon with a deadly grip, yet the long, blackish figure in the river only floated closer, undisturbed by the old man’s readiness for mortal combat. The boy crept toward the water’s edge as the elder gradually lowered his machete to chest level. They stood cautiously studying the log and figure drifting toward them. Leaves, blades of grass and streaks of mud painted the wide back of a man, camouflaging his skin. His head was turned to the log with mouth open, hard-pressed against the bark, barely above the waterline. An arm of knotted muscle draped the log. Ignoring any dangers, Ignacio raced into the river until he was almost waist-deep. He pulled the log toward shore, all the while trying to keep the stranger’s face upright to prevent drowning. When the log lodged into the riverbank, the boy tried to lift the unconscious man. The limp weight was too great for him and the arm about the log held it in a death grip. A feeble groan came from the lips of the mud-streaked, naked giant. One eye opened briefly, rolled and showed white then closed. The elder jabbed his machete into the ground and grabbed a wrist. Papito and his grandson pried the arm from the log and together tugged until the body slid through the mud and lay fully ashore. Ignacio knelt by the nearly lifeless man’s head and gently rubbed the river’s filth from his face. Another low groan flowed from the man’s lips, only this time carrying with it the mental suffering of a wounded soul. The boy leaned close, his ear almost touching the river giant’s mouth. “Que dice? What does he say?” Papito asked anxiously, examining the half-dead stranger as he sat beside him across from his grandson. No reply. Ignacio remained bent over the man, eyes half-closed, straining to hear the slightest word. Sympathetically shaking his head, Papito slowly sat upright, his eyes flushed with pity. He made the sign of the cross. The grandfather gently brushed mud and strings of river weeds from the battered man’s chest, carefully eyeing the red splotches left by dozens of ant and insect bites. Still stunned by their discovery of the stranger, the boy eased back onto his heels, glanced at the wounds, and stared at the warrior-like features of the man who now lay upon death’s doorway. Compared to the people of his village, here was a giant among men that easily stood a head taller than any of them. Ignacio had never seen anyone so muscled and strong in appearance. Long black hair imbedded with twigs, mud, and grass hung matted from his head, and a wild, mud-smeared beard veiled his cheeks and throat. His deeply tanned skin told of relentless days under the jungle sun, but about his groin where a tattered loin cloth of some form had once been, a paler tint portrayed his true color. “Tell me, Ignacio. Did he say who did this to him?” The grandfather’s brown eyes were stretched wide on his wrinkled face, his gaze blending curiosity and dismay. Horror swathed the old man’s face. Mouth agape, he recoiled from the wounded giant as if he were a viper about to strike. The elder rose, grabbing his grandson’s arm with such force the boy fell back into the dirt. Papito stepped back and motioned his grandson to him as he stared at the stranger. When Ignacio drew near, the old man wrapped his arms tightly about the boy, kissed the top of his head, and fervently made the sign of the cross when he looked at the tortured man again. Watching the stranger as if anticipating he would rise and attack them, the elder retrieved his machete. He lightly pushed his grandson back until they were ten paces away. Sweat trickled down Papito’s temples. The jungle air felt thicker to him, more humid than only moments before. Rising to its zenith, the sun cooked the land and all within its reach. The old man knelt and jabbed the machete into the ground, letting his hand rest on its handle. Conflict showed in his eyes as he struggled with his thoughts. For the first time in his life Ignacio saw dread mounting in his abuelo’s eyes, and the sight of it frightened him. Yet something about the hurt giant silently cried out for help and Ignacio could not leave him to the fate of the jungle. Papito’s eyes slowly closed, his face somberly masked with the resolution of a determined action. Pulling the machete from the ground as he rose, he exhaled deeply, never removing his gaze from the stranger. His grip tightened on the machete’s handle until his knuckles grew white. “You cannot kill him!” the boy shouted, arms held out to block his grandfather’s path. “He has done nothing to us.” Ignacio stood his ground but across his face was uncertainty about what he should do next. “Silencio, Ignacio!” Papito’s voice rang hard. “Now leave me. Return to the village. You must not see this.” The grandfather started around the boy, staring all the while at the unconscious man. Fingers feebly moved on the stranger’s right hand. A pain-drenched groan carried louder than before into the air. “Why, Papito? Why must you kill him?” the boy asked, shifting his position to remain in front of his grandfather. As the dread gripping the old man broke its hold, his gaze softened. He looked at his grandson with a desire to speak all he had been holding so long within his heart. He pointed with the machete to the battered man. Lowering his gaze to meet Ignacio’s, Papito turned and gestured eastward to where the Ucayali River became the Amazon and then swung his hand toward the south. Immediately he made the sign of the cross and nervously looked at the stranger, almost expecting him to rise in demon form. Ignacio readied himself to argue more, but a strained voice from behind startled him. In a single leap he was beside his grandfather, staring as wide-eyed as Papito at the grimacing man in the dirt. The wounded stranger gazed glossy-eyed in the direction of the voices he had heard. He tried to speak again. A wrenching agony shot throughout him, sending him back into oblivion. His head fell hard back into the mud. “Por favor, Papito. Please. He is not evil. I know it, I know it. Por favor. Let me go to the village and bring the others to carry him. Look at his body. Someone has done these things to him. He needs our help,” the boy pleaded. He held fast to his grandfather’s arm. An eerie silence settled over the jungle as if the ruthless land awaited the old man’s declaration of a death sentence. But it never came. Glancing from Ignacio to the unconscious man, Papito nodded begrudgingly. Ignacio smiled and raced into the jungle. The grandfather watched him leave then turned toward the wounded man and sighed wearily. He sheathed the machete and stood staring at the stranger. Ignacio sat patiently near the stranger’s mat, leaving only to do his chores, and always returning quickly in hopes of being present when the sleeping man awoke. Two weeks passed before the stranger’s health allowed him to sit upright and remain awake for any length of time. When given soups filled with crushed coca beans and healing herbs, he slurped the bowls empty like a starved animal and watched the villagers outside the thatched-roof hut as if they were brutal captors. By the third week of the stranger’s resurrection from the dead, Ignacio had not heard the man speak other than to cry out from the nightmares that seemed to regularly travel the dark canyons of his mind. But on the first day of the fourth week, the ruggedly built man surprised him. “Are you the boy from the river?” asked a gentle voice. Stirring from his afternoon nap, Ignacio rubbed sleep from his eyes and looked about in confusion. He was startled when he realized the stranger had spoken. He nodded hesitantly as he stared at the man sitting on a mat across the hut from him. The deep blue eyes of the stranger gradually closed as fatigue overcame him. A second later they opened with the glare of a troubled man. He glanced at his fresh loin cloth, and then to the multitude of scars and wounds lacing his chest. Raising a hand, he touched his shaven face and felt of his hair. It was clean and clipped short. Wearily he shifted his gaze to the young boy studying him. The stranger nodded approval and watched the dark-skinned boy’s smile widen. No reply or hint of thought came from the stranger as he looked at the boy. “So, the mud-giant has come to life,” Papito said, his voice carrying a cheerful tone as he walked up the hut’s rickety steps. He halted at the foot of the stranger’s mat and stood with a hand resting casually on the handle of his machete. Not wanting to appear as if he were staring, he let his gaze carry a moment about the open-sided hut then returned his eyes to the silent man. At a glance it was evident immense strength lay beneath the tautly stretched skin. Iron-like muscles flexed with the stranger’s slightest movement, and yet he seemingly retained the agility of a jungle cat. Without his matted mane and mud-caked beard, he was surprisingly handsome, with high cheekbones, chiseled chin, and an aquiline nose. His superb physical conditioning hid his age well, but about the coldly staring eyes that watched the world with the alertness of a wild animal, were faint wrinkles which told of matured years. Although the man now sat on a mat, Papito remembered how tall he was when the villagers first lifted him from the riverbank to carry him here. They shook hands and Papito observed a fleeting glimpse of amity appear in Alvarez’s eyes. The old man’s apprehensions about the stranger lessened, yet he remained cautious. Anxious to report the stranger’s condition to his grandmother, Ignacio dashed from the hut, clearing the steps to the ground in a single leap. Papito warmly smiled as he watched the boy race away. Turning, his smile faded when he found Alvarez staring at him, face devoid of emotion. Unnerved at first, Papito took a cross-legged seat on the hut floor, casually adjusting his machete into an easily grasped position. Alvarez closed his eyes and rolled his head on his shoulders then slowly raised his arms above his head and stretched like a cat after a long nap. His face mirrored the pain coursing his aching body from the movement as his open hands clenched into knotted fists at the agony, yet he continued to flex as if needing to test his agility. The village elder sat fascinated by Alvarez. In all of his seventy years, as best he could recall, he had never seen such a man. The skin appeared ready to rip from the constant strain of being stretched over hardened muscles. Along Alvarez’s chest, legs, and arms lay a visible network of veins, thick as twine. But of all that captivated Papito, the faraway stare of the blue eyes disturbed him most—a stare saturated with suffering, hate, brutality, and compassion, all wrapped within the same gaze, leaving one to wonder what Alvarez’s next action might be. Alvarez nodded and glanced at the growing crowd of villagers gathering outside his hut. The elder waited, hoping Alvarez would provide more information about himself, but only silence filled the void between them. Papito’s words struck a violent chord. Alvarez’s deep blue eyes narrowed and burned wildly with animalistic madness. The tension sweeping through him was obvious. His nostrils flared and his chest rapidly rose and fell as his breathing became labored. “Calm yourself, Señor Alvarez. You are among amigos, friends, here. No one means you harm. I apologize for disturbing you as I have.” Papito realized his initial fears of the man were warranted. Yes, my big friend, you have been to the land of evil, he thought, keeping watch on Alvarez. For a man such as you to fear the mere mention of demonios means they have held your heart in their hands and squeezed the life from it. Nothing more was spoken between them while they waited for the food to be brought. Minutes passed before Alvarez calmed enough to sit vacantly staring at the children who giggled, smiled and pointed to him. He wrung his hands slowly, at times squeezing so tightly the knuckles grew white, then whatever fire burning his soul settled and he drew still. Papito took note of the immense sadness dwelling in the stranger’s eyes as he watched the children of the village. Such was the look of a man who had witnessed far more than a hundred lifetimes could bear. But as quickly as it came, the wretched mood left Alvarez, replaced by a cruel gaze which held him spellbound. Ignacio elbowed his way through the villagers on the steps and proudly carried a bowl to Alvarez. The savory aroma of roasted monkey meat, cooked yams, and fresh bananas immediately permeated the hut. Ignoring the crowd of curious onlookers, Alvarez glanced at the bowl then to Papito. “Gracias, señor.” His thanks in Spanish fluently rolled off his tongue. Stomach growling from hunger, he began to devour the food. Alvarez nodded and continued to eat. “Here, in my village, we have learned to speak inglés from the sacerdote, the priest, who comes and stays at our village. He says we should learn this because it is importante to know if we are to trade with those doing business in the Amazon. This is why my nieto speaks your language. I wish to make his life better than mine.” Papito lovingly hugged Ignacio and ruffled his thick mane of black hair. A frown of embarrassment spread over the young man’s face as he squirmed beside his grandfather. Setting the empty bowl in front of Ignacio, Alvarez nodded appreciatively and wiped his mouth with the back of a hand. He looked at Papito as if all the man had spoken went unheard. “Thank you for the food,” he said softly, fatigue masking his face. Without further word Alvarez rolled back onto his mat and closed his eyes. Ignacio watched Alvarez’s chest rise and fall in slow, measured movements. He glanced questioningly at his abuelo with raised eyebrows. The grandfather gestured for him to be quiet and together they left Alvarez sleeping in the hut. “Did you see, Papito? He is not an evil man. He will not hurt us,” Ignacio said, walking beside his grandfather. “Yes, I believe he is not evil. Neither are the jaguars of the jungle, but they will hurt you when they are afraid,” the old man replied, resting a hand on his grandson’s shoulder. Papito let his hand slide from the boy’s shoulder and looked to the orange glow of the setting sun. “Of the demonios that dwell in his dreams, Ignacio…of the demonios who have touched his soul,” said the elder, voice barely above a whisper. Weeks passed before Alvarez was able to walk about the small village without the assistance of a staff to steady his balance. Although the adults no longer watched his every move, swarms of children excitedly trailed him at a respectful distance and remained his constant shadow. The flesh wounds crisscrossing Alvarez’s chest and back healed, leaving a patchwork of scars that unknowing to all except Papito, ran deeper than the skin. As his health improved, so did his appetite and strength. Once able to work, Alvarez repaid the kindness of Papito’s family by chopping wood and carrying their heavy bundles. Standing out of sight, Papito would watch in amazement as Alvarez relentlessly swung a heavy axe for hours, often driving its steel blade through a log with sheer brute force. Naked except for a loin cloth, sweat dripping from his body, the quiet giant pushed himself to extremes each day, seemingly punishing himself as if the pain he created was penance for past horrible deeds. At day’s end, exhausted from the grueling labors, Alvarez bathed in the river and sat alone for hours on the bank to watch the river flow lazily past. Against his better judgment Papito grew to like Alvarez, yet always there remained an element of fear within him—fear that one day the Americano would explode in a violent rage and vent the troubles plaguing his soul. After weeks of observing Alvarez’s mounting restlessness, Papito realized he must find the right moment to talk with him. A full moon rose over the jungle into the Amazon night, its perfect white orb illuminating the village and surrounding land in a tender blanket of light. Across the sky, stars glittered and sparkled like precious gems in an overflowing treasure chest. The noise of the village settled into peaceful silence as children fell fast asleep for the night and the creatures of the jungle silently prowled until dawn. An occasional cry of fright momentarily cut the air when an infant awoke but soon serenity returned once more to the rows of huts. The elder drew a deep breath, knowing the time to talk had arrived. “Here, take this, señor.” Papito handed Alvarez a dented metal cup of steaming coffee then took a seat beside him on the hut steps. He lifted his own cup and sniffed its strong aroma. A gentle smile formed. Alvarez barely turned his head enough to look at the village elder then let his gaze return to the cup held tenderly in his hands. “Thank you for the coffee,” he said in a voice slightly above a whisper. Disappointment passed through Papito. He truly believed Alvarez would use the opportunity to say more than he had. But the night was young, and there was still time to probe the stranger’s heart. They drank their coffee in silence, gazing at the stars and staring at the shadows of the night cast by large pit fires set about the village to ward off jungle predators. An hour passed with Alvarez doing little more than occasionally swatting a mosquito and sighing remorsefully at times when he looked heavenward. Glancing at Alvarez, Papito felt a sense of guilt at having once thought of killing him. A sudden, driving compulsion to apologize forced words to the tip of Papito’s tongue, yet he lacked the courage to speak. But, as if Alvarez had read the old man’s mind, he turned his face to look at him. The elder was about to sip his coffee but stopped, lowered the cup and exhaled hard. “Animal?” Papito sensed the deeply rooted pain emanating from Alvarez. It sent a maelstrom of emotions swirling through his mind. When he spoke again it was with the voice of a father who suffers each day with the longing to talk to his son once more, yet knowing he never will. “John, why do you say this? You are not an animal. Yes, I was afraid of you—of where you had been and what could happen to mí familia. That is why I thought it better you die at the river.” He hung his head in shame and gazed dejectedly at his bare feet. “You must understand, when I saw you and heard you call the name—” Papito paused and made the sign of the cross. “I remembered my son, Ignacio’s father. May God forgive me for my sins.” The voice trailed off. The elder could no longer talk. The old man nodded as if the movement tore at his heart. Sorrow pierced the old man’s soul at the memory. Eyes glistening in the firelight, Papito inhaled deeply to stem the hurt rising fast in his throat. When his gaze carried to Alvarez once more, the suffering made it difficult for him to speak. Alvarez sat staring at the old man, torn between his grief and the understanding of the torment Marco had endured. Tears trailed Papito’s cheeks as he looked at Alvarez. When anguish at last overpowered him, he lowered his face and sobbed without shame. The floodgates of his heart opened. Years of concealing his pain flowed freely from him. Laying a consoling hand on Papito’s shoulder, Alvarez waited patiently until he regained his composure. Alvarez drew rigid, breathing labored. He felt his chest constrict and heart pound as if it were struggling to break the confines of his body. The blood coursing his veins raced like a raging river, becoming scalding and seemingly burning his flesh. His arms shook in spasm while his hands flexed into knotted balls. He shut his eyes, forcing himself to calm before savage memories took hold and began to rake his mind. Papito’s apology went unheard. Alvarez’s mind finally obeyed him and blanked in self-protection. 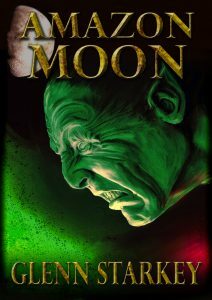 The moon had shifted positions across the sky before he looked at the village elder again, yet when he did, a blend of cruelty and bitterness lay below the fragile surface of his calm gaze. “The truth may hurt your more than you realize. Are you prepared to live with more pain?” Alvarez’s tone grew unsympathetic. His own mental suffering dwelled within him like a volcano on the verge of eruption, and unknowingly he wanted to release the mounting pressure. “We have all night to talk, John. The sacerdote says confession is good for our souls and cleanses us. Already I have told you more than my own familia, even the sacerdote, knows about my son. I have kept the black secret in my heart all these years, but telling you has let me breathe once again. I will carry Marco’s death to my grave, and what you say to me this night will go with it. On this I swear before God.” Papito made the sign of the cross. Alvarez nodded. “Good, because I know there is a hell. I’ve been there.” In the pervading moonlight his features took on the stoic appearance of cold granite. Whether it came from the fire burning in his soul or was an illusion of the night, the old man observed an inferno of madness ignite in Alvarez’s blue eyes. 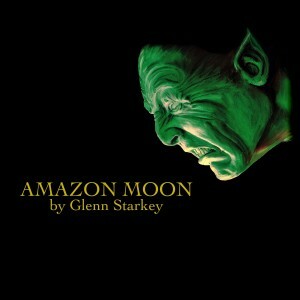 And having spoken, Alvarez solemnly took a deep breath, looked at the Amazon moon, and began his macabre tale….